It’s the end of March, and I finished my March Bee Block and BoMs! First up is the block for Stash bee, hive #12. Jennifer requested the Arizona block from the We Can Do It! 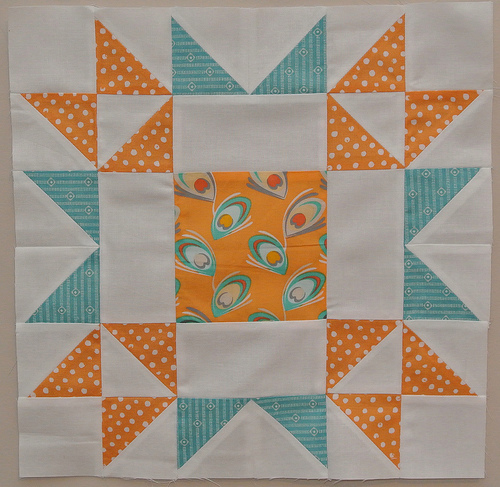 Skill Builder Sampler at Sewn by Leila. She wanted orange and turquoise, so I hope she likes this block 🙂 I think I am going to have to make another one of these in my colors! Up next, I am still working my way through the 2013 Lucky Stars BoM. Below is the March 2013 block. I had the absolute worst time with this block. I don’t blame the instructions, it was completely me. It seemed every piece of fabric I could cut wrong, I did. Or sew on backwards. Or run out of the fabric less than halfway through the block. Let’s just say I was very happy when this was done. 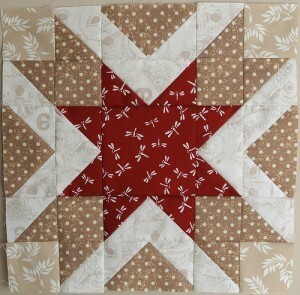 I am also convinced there is any easier way to get this look than the way this block was done. If I didn’t have such a terrible experience doing it, I would probably figure out the easier way. Instead, I just plan to have this be the one and only time I ever do this block. 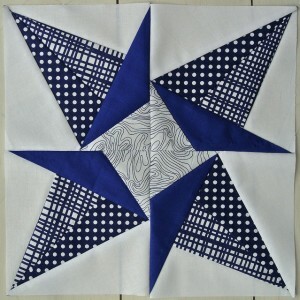 I am also doing other blocks for the sampler as I see ones that I like. 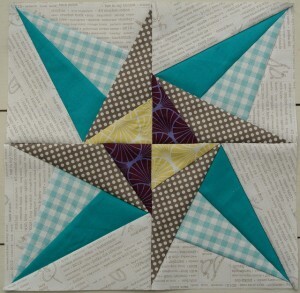 This is the January 2013 Aurifil BoM. I think this one puts me at 11 total… I did the math, and I think I need 36 with the sashing I want to get it the size I want. Almost 1/3 of the way done! 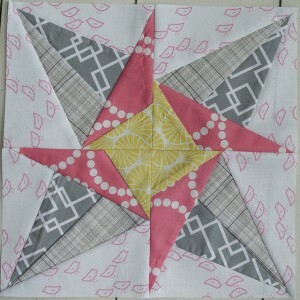 Linking up to Anything Goes Monday, WiP Wednesday @ Freshly Pieced, Paper Piecing Party @ Quiet Play, BOMs away, and Let’s Bee Social Wednesday @ SewFreshQuilts. 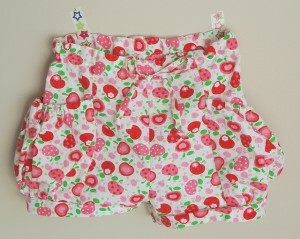 In preparation for warmer weather, it was high time to make some shorts for my 1 year old daughter. I needed a quick finish, so I actually made the exact same shorts I made her last summer – the Elegance and Elephants (E&E) Bubble Pocket Shorts. I also made them in chambray last summer. This summer I sized up and made the 18M/2T size, and they are a little big on my little girl. Width wise, they are fine (need to tighten up the elastic a little), but they are loooong! And she is tall, so that tells you how long they are. It’s hard because the sizing choices are 6/12 month or 18 month/2T. I think there really needs to be another size in there for the little ones. One the plus side, they should fit for this entire summer, and possibly next summer. 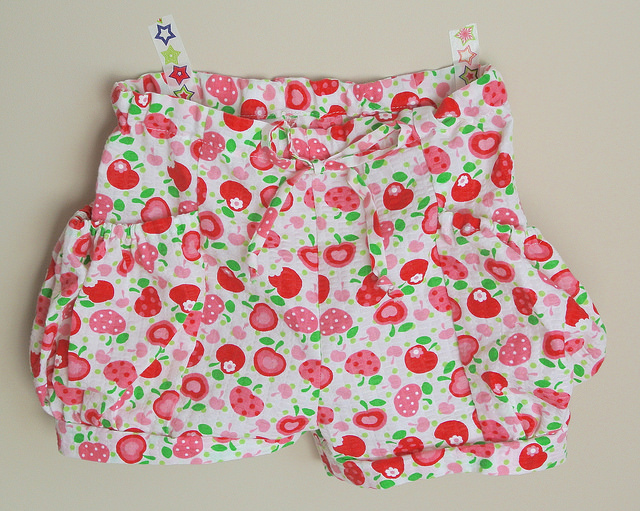 This summer I had the advantage of constructing these shorts with my serger, and they took much less time! Last summer, I didn’t have a serger yet so I had to finish every seam and it took forever. On the plus side, I think finishing the seams that way created a slightly nicer finished garment, but not so much nicer that I would do it instead of the serger. The fabric was purchased from JoAnns last summer. It has the texture of a seersucker, but isn’t quite. If I make another pair of these, I am going to attach the bottom binding the pre-serger way. I prefer the look of attaching the bottom as binding and enclosing that bottom seam. It also shortens the shorts a little bit that would have helped with fit. I also think it made the bottom hem lay a little bit neater. I would pull out the pair from last summer to demonstrate, but they are deep in the attic land of too-small clothes. In the picture below, they are riding up a little bit so you don’t see just how long they are. Her hat is my favorite Little Betty Bonnet. I made the 12-24 month size as the directions call for. This is at least my 6th version of this pattern, so it’s a winner! I love a little girl in a bonnet, and this is her spring one. 1. 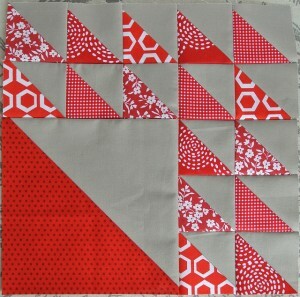 COMPLETE: Two blocks for my “Real World Red & White” Sampler. 2. A shirt for me. I’ve been wanting to make my own clothes for awhile, so why not start? 3. COMPLETE: Get ready for spring! I need at least one pair of shorts for my daughter, preferable more. 4. COMPLETE: Acknowledge that spring is not here yet, therefore make a couple pairs of pants for my daughter. 5. Complete the March Stash Bee block – that’s not a real goal, more of a must finish, but I think it still counts (and makes this list a little less clothing heavy). – working on it! 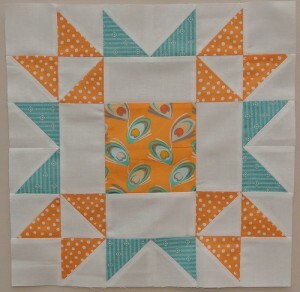 Linking up to: Anything Goes Monday, Let’s Bee Social Wednesday @ SewFreshQuilts, and Sew Cute Tuesday @ Blossom Heart Quilts. I finished up the winter round of the 4×5 modern bee, with wonderful results! I also have the final version of all of the blocks I made complete. First up, the blocks I received. I was in Hive 4, and I think everyone really did a good job making some awesome blocks! The blocks I sent are below. 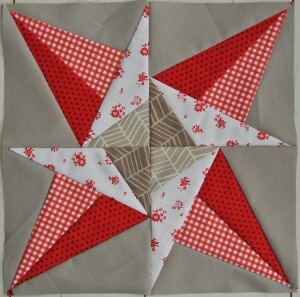 I used the January 2013 Lucky Stars BOM pattern from Don’t Call Me Betsy. I’m linking up to the 30/30 Challenge, even though it’s kind of a stretch. I have been sewing, but between a terrible virus working its way through my household and a few dark and dreary days I have no pictures to show for it. Hopefully it will get nicer this week, and I can show my real progress. 3. Get ready for spring! 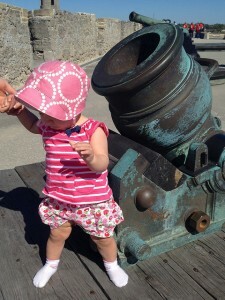 I need at least one pair of shorts for my daughter, preferable more. 5. Complete the March Stash Bee block – that’s not a real goal, more of a must finish, but I think it still counts (and makes this list a little less clothing heavy). 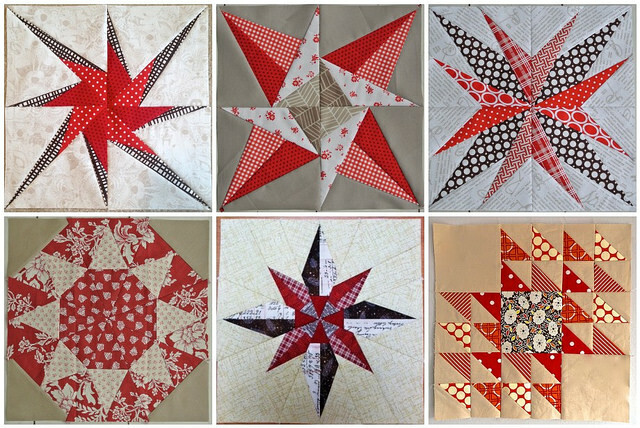 Also linking to Anything Goes Monday, Fabric Tuesday @ Quilt Story, WiP Wednesday @ Freshly Pieced, and Let’s Bee Social Wednesday @ SewFreshQuilts. To add another block to my Real Life Red & White quilt, I chose a little bit quicker one than I’ve been working on lately. I chose the Aurifil February 2014 BOM. In addition, I received two more of my blocks from the Winter 2014 4×5 Modern Quilt Bee, so it’s like I finished THREE blocks toward my goal! Just kidding, I’m halfway to my first goal for the 30/30 challenge. I still have some more projects I’ve been working on that just aren’t ready to show yet. 1. 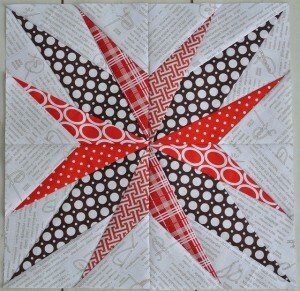 Two ONE block for my “Real World Red & White” Sampler. 4. Acknowledge that spring is not here yet, therefore make a couple pairs of pants for my daughter. 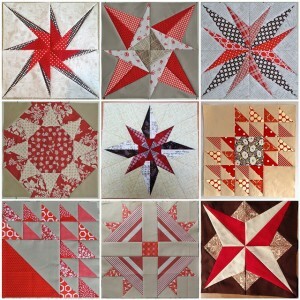 Sarah at Berry Barn Designs is hosting a fun 30/30 challenge in March. Her challenge is to sew for 30 minutes a day for 30 days. I think it’s a fun idea, and will play along as much as I can. What would I like to get done this month? 1. 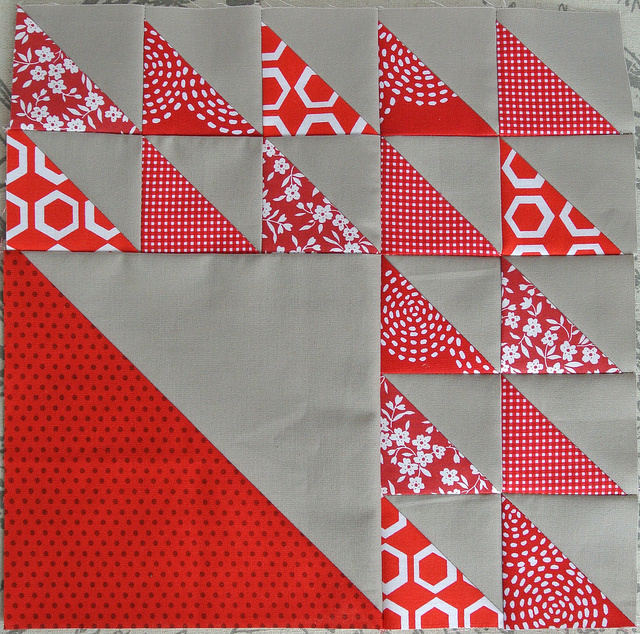 Two blocks for my “Real World Red & White” Sampler. My blocks so far are below. 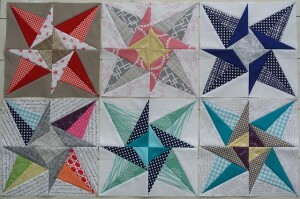 The top blocks are the Practice, January and February 2013 Lucky Stars BOMs. The bottom blocks are what I’ve received so far from the Winter 2014 Hive 4, 4×5 Modern Quilt Bee. This is doable, right? Anyone else want to join the challenge? 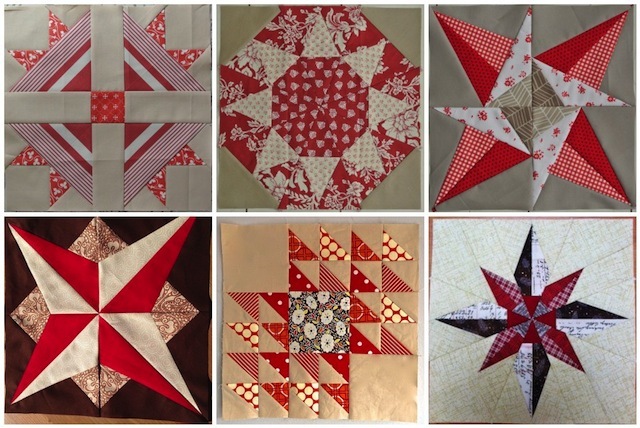 I decided to sign up for the Winter 2014 4×5 Modern Quilt Bee this round. 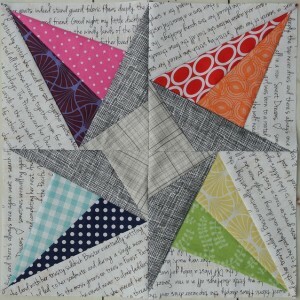 I chose the January 2013 paper pieced block from the 2013 Lucky Stars BOM. This is also what I spent most of February doing, thus most of my entry to Fresh Sewing Day! My color scheme is red and tan, with some brown. It’s adjusted some as I make more blocks for this sampler quilt. I decided it’s best described as a real life red and white quilt. I love red and white quilts, but it’s just not realistic for everyday use with a daughter and a dog. So, by adding tan and brown, I think it’s more realistic for everyday use in my life. Philippa asked for aqua/teal, pink/purple, grey and a touch of mustard with a white/grey/black low volume background. Kendra asked for any shade of blue with a white background. Maureen asked for blues and greens, “ocean” colors, with a white background. Jodi asked for rainbow blocks with any kind of a neutral text print background. Jennifer asked for pink, yellow, grey with a white, light grey, or low volume background. 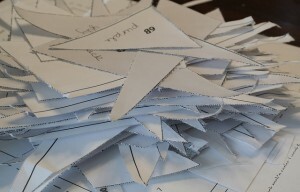 Also, in case you were wondering what the papers from 5 paper pieced blocks looks like, see below! 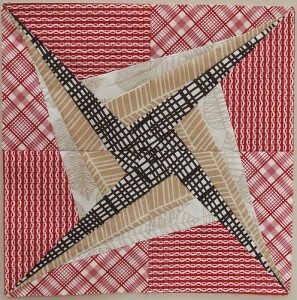 I also made another block for my “Real World Red & White” quilt sampler. This one is the February 2013 block from the Lucky Stars BOM club. I’m caught up – just a year later than planned 🙂 I’m enjoying where this quilt is headed though. I still hope to finish 2-3 blocks a month to keep on track to finish this by the fall. Since my contribution to this bee is finished, I’m linking up to Finish it up Friday @ Crazy Mom Quilts and TGIFF. 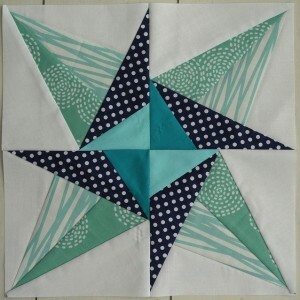 It also counts as my WiP Wednesday @ Freshly Pieced for the week, Anything Goes Monday, Paper Piecing Party @ Quiet Play, and Let’s Bee Social Wednesday @ SewFreshQuilts.